Distal arthrogryposis type 9 (DA9 – also known as congenital contractural arachnodactyly or Beals / Beals-Hecht syndrome) is caused by heterozygous mutation in the fibrillin-2 gene (FBN2), which is crucial for microfibril structure. The transmission is autosomal dominant. Due to its genetic etiology, it show some clinical overlap with Marfan syndrome, which is caused by mutation in the fibrillin-1 gene (FBN1). Beals syndrome patients may have a better prognosis in comparison to most cases of arthrogryposis multiplex congenita/fetal akinesia syndrome. However, de novo cases tend to be more severe. DA9 is rare and affects mainly the connective tissue, leading to contractures, dolichostenomelia, pectus deformities, kyphoscoliosis, arachnodactyly, and crumpled helix of the ear. 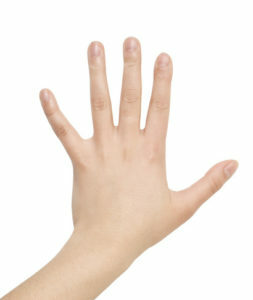 It could be considered as a combined Marfan syndrome and arthrogryposis multiplex congenital, because it shares some clinical features with the FBN1-related Marfan syndrome, though the ocular and cardiovascular complications of the Marfan syndrome, although possible, do not usually occur in DA9. Some signs may even suggest osteogenesis imperfecta. Overall, all the following clinical features have been reported in different combinations: dolichostenomelia, marfanoid habitus, scaphocephaly, brachycephaly, dolichocephaly, micrognathia (present in about one third of patients), frontal bossing, crumpled ear (present in the majority of patients), poorly defined conchae, prominent crura, folded helices, ectopia lentis, myopia, high-arched palate, relatively short neck, mitral valve prolapse, mitral regurgitation, atrial septal defect, ventricular septal defect, bicuspid aortic valve, patent ductus arteriosus, aortic root dilatation, pectus carinatum, osteopenia, congenital kyphoscoliosis, hip contractures, elbow and knee contractures (very frequent), subluxation of the patella, arachnodactyly, camptodactyly, ulnar deviation of fingers , adducted thumbs, flexion contractures of proximal interphalangeal joints, metatarsus varus, talipes equinovarus (one third of patients), hypoplastic calf muscles, and motor developmental delay. Cardiac features have rarely been documented in adults with DA9. A sporadic patient developed decompensated dilated cardiomyopathy. Interestingly no mutation was found in either the FBN2 or FBN1 gene in this patient. Similarly, aortic dilatation and/or dissection (which are typical of Marfan syndrome) have been rarely documented in DA9, but remain possible. Narrowing of the foramen magnum, with partial fusion of C2-C3 vertebral bodies, has been reported in one case. Clinical features of arthrogryposis multiplex congenita/fetal akinesia syndrome (AMC/FAS), including clenched fists and multiple joint contractures, can be found on repeated prenatal ultrasound examinations. Several missense and splice mutations have been reported in the FBN2 gene to cause DA9. Interestingly, some missense mutations have been found to exert an impact on the splicing process. Large FBN2 deletions have also been described. Although rarely, patients without a detectable FBN2 mutation have also been reported, so locus heterogeneity seems likely. Full sequencing of the FBN2 coding sequence plus exon/intron boundaries can be done to detected DA9 causing mutations. However, since arthrogryposes are genetically and clinically heterogeneous and DA9 may even show clinical overlap with Marfan syndrome, panel testing based on clinical exome sequencing (EXOME PANEL) is recommended. Posted in Academia, Disease cards, Last Update, Medical Genetics and tagged Arthrogryposis, arthrogryposis multiplex congenita, FBN1, FBN2.